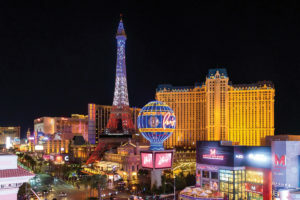 In celebration of the resort’s 20th anniversary, Paris Las Vegas unveiled a colorful light show on its half-scale Eiffel Tower replica. Inspired by the Eiffel Tower’s illuminations in France, the attraction’s enhanced lighting features a free, recurring show with hundreds of synchronized and choreographed twinkling lights. The light show runs nightly every 30 minutes from sunset to midnight.